Main Roads Western Australia engaged WML to complete the geotechnical investigation and pavement design, as well as geometrical design from concept through to the detailed design. WML was further engaged to provide construction support during the construction phase. MRWA engaged WML to complete the Geotechnical investigation and pavement design as well as to complete the geometrical design from concept through to the detail design and produce a set of documents for Category 2 open tender. WML was further engaged to provide construction support during the construction phase. This project required a two stage design approach. Stage one involved a temporary alignment to create a river crossing for oversize/overweight vehicles hauling sections of plant up to the proposed Perdaman Urea Plant. 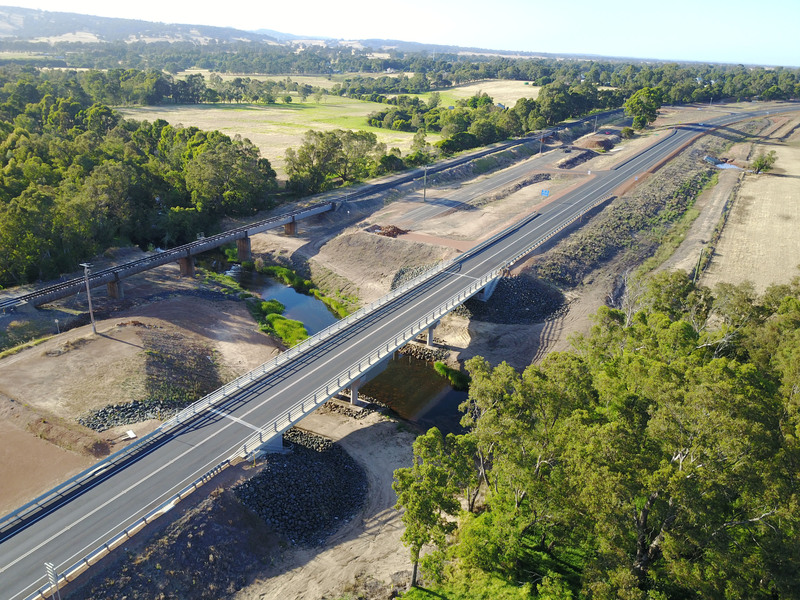 The second stage involved the ultimate alignment of the South Western Highway including the replacement of the Collie River bridge with a concrete structure. The project also involved the replacement of a second bridge structure with a large culvert structure, involving some complex Geotechnical issues with acid sulphate soils in an old ox-bow lake. Our Geotechnical team was also engaged to complete the pre-loading design for the new bridge structure and the Civil team provided a separate set of drawings for this part of the project to be completed under a different contractual arrangement. The re-alignment of the existing road in the Raymond Road intersection area required some intricate engineering details to incorporate existing underground drainage structures and allow constructability under traffic. A major section of the new alignment was kerbed and drainage had to be facilitated through side entry pits and an underground piped system. The design accommodated the re-alignment of the northern Burekup entrance (Russell Road) and Orchard Drive. The drainage design required the containment of all rainfall run-off to be contained inside the road reserve until it could be discharged into detention basins, for settling out of solids before discharging into the Collie River. A number of service relocation were accommodated and the WML team provided design support to the MRWA project manager in order to facilitate required relocations. WML interfaced seamlessly with the appointed bridge design consultant and pro-actively arranged design correlation meetings to ensure interface between bridge and road drawings was without problems.